Cie Goulet studied at the San Francisco Art Institute and graduated from the University of Oregon in the 1960s. She went on to study at the Parson’s School of Design in New York in 1973 and continued to live there through the 1980s. After settling in Oregon for some time, she eventually moved back to the Bay Area in the late 1990s. Goulet’s work has been in numerous exhibitions on both the west and east coasts. 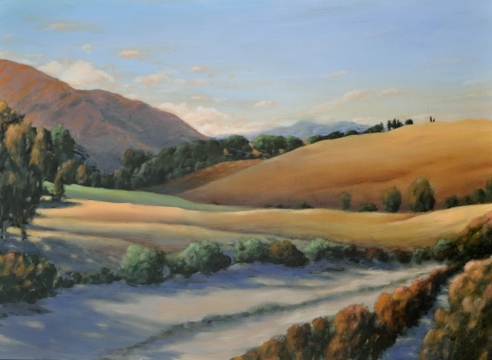 Her work is in private and public collections, including Kaiser Permanente, Portland and Seattle; Microsoft Corporation, Redmond, WA; Oregon Arts Commission, Salem; Oregon State University Valley Library, Corvallis; Portland Art Museum, OR; University of Oregon: AAA, Science Complex, and Knight Library, Eugene; and Willamette University, Salem, OR.